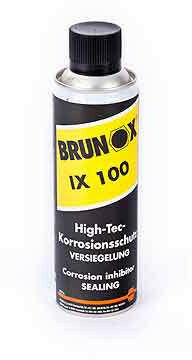 Brunox® IX 100 forms a High-Tec -anti-corrosive waxy film for metal products and machines under difficult environmental conditions. It is suitable for the most corrosive environments (salt water) and for the direct effect of adverse weather conditions. The wax-like protective film does not become brittle, remains compact and forms a perfect high-quality sealing. It can be used as cable end sealer and pipe joint protector in utilities. Brunox® IX 100 can be removed by means of white spirit or petroleum solvents or Brunox® Turbo-Spray® when protection is no longer required. long-term corrosion inhibitor Sealing for storage in the open air and (during the winter/summer) and also sea transport for motors, shafts, steel coils, valves, machines, precision tools, semi-finished and finished products, agricultural and construction vehicles, plants of all types.